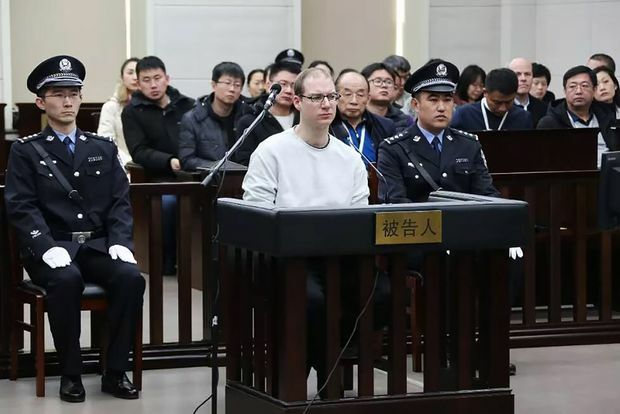 This photograph taken and released by the Intermediate Peoples' Court of Dalian on Jan. 14, 2019, shows Canadian Robert Lloyd Schellenberg (centre) during his retrial on drug trafficking charges. "As your counsel has noted, drug trafficking is a very serious matter," Justice Brown told Mr. Schellenberg, then 29. "It is a scourge in our province and our country. Your country deserves much better from you. Mr. Schellenberg's drug offences date back to 2003, when he was convicted of possession and received a six-month conditional sentence and six months' probation, according to court documents.